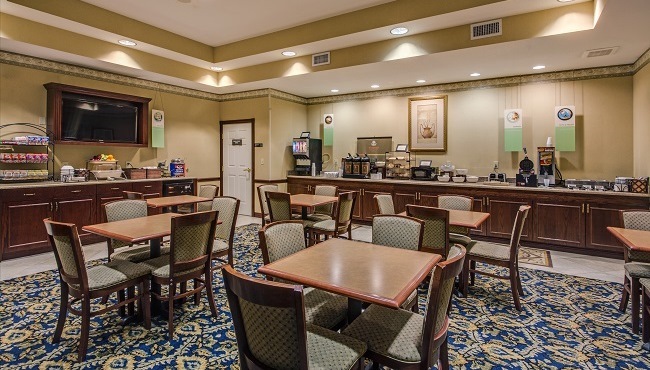 At the Country Inn & Suites in Brandon, FL, the whole family can wake up to a great meal thanks to our free, hot breakfast. From warm Belgian waffles and sausage to yogurt, fresh fruit, bagels and cereal, we offer a variety of tasty breakfast favorites sure to delight members of your travel party. Catch the news on the dining room’s flat-screen TV, or use free Wi-Fi to research lunch and dinner options at one of the many nearby restaurants, including Cherry’s Bar & Grill and Tres Amigos Cantina.